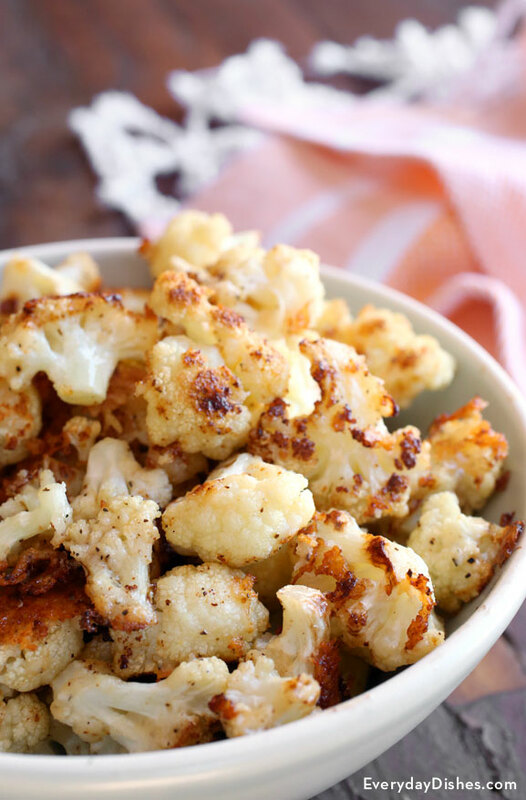 Cauliflower is mild to taste, but with all the right seasonings, it’s absolutely fabulous. We never knew veggies could taste so good until we whipped up our easy roasted cauliflower recipe. It’s the right amount of crispy on the outside and the perfect amount of tender on the inside. We used a head of cauliflower and five common kitchen ingredients—butter, garlic powder, salt, pepper and Parmesan cheese. It seems too simple to be so good and true, but you’re going to have to trust us on this one. Add a little zip if you like it hot with anything from hot sauce to red pepper flakes. You also can add your favorite fresh herbs for an earthy pop of color and flavor. Enjoy this dish as a healthy snack or on the side of easy stuffed chicken with basil. It’s all flavor and zero guilt. Spray two half-sheet baking pans lightly with olive oil cooking spray. Stir the melted butter, garlic powder, salt and pepper in a large mixing bowl then add the cauliflower florets. Toss until each floret is completely coated with butter, then toss with Parmesan. Transfer florets to the prepared baking sheets and space them evenly and as far apart as possible so they don’t steam each other. Bake 18–20 minutes, turning once halfway through. Remove these yummy bites from the oven when they’re fork tender and golden brown. Enjoy! Add a little zip to this recipe with red pepper flakes!